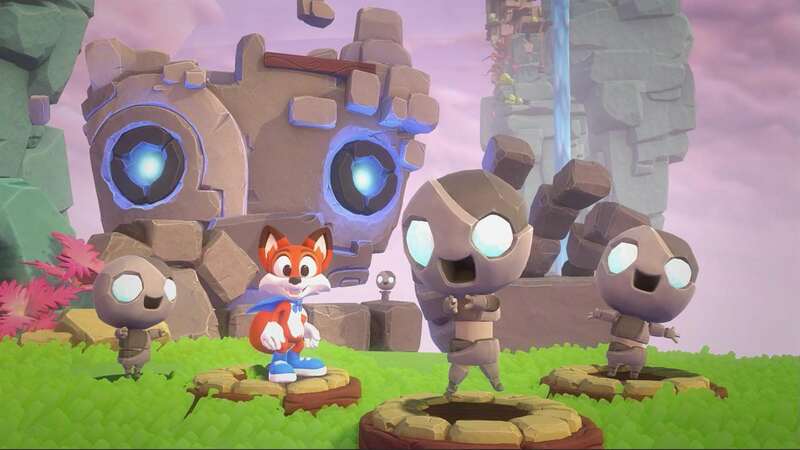 Super Lucky’s Tale is a Microsoft exclusive which follows the main character, Lucky, as he tries to thwart the evil Kitty Litter group and save his sister. The protagonists and antagonists are looking for the Book of Ages, a relic which can reshape history itself. As the heroes and villains battle it out to acquire the book, they are all sucked into it. It’s now up to Lucky to beat the members of the Kitty Litter crew and proceed through the story told by the Book of Ages. Lucky must jump, dig, and spin attack through 4 unique worlds and collect lucky clovers to access new levels and worlds. Will Lucky be able to defeat the kitty litter crew and rescue his sister? There’s only one way to find out. Easy Difficulty, Family Friendly: It’s obvious from the charming artistic style, characters, and level design that the game is catered towards casual gamers and younger audiences. All levels contain numerous checkpoints and one main objective to carry out in the stage. The game allows players of lesser skill to obtain enough lucky clovers to progress through the game without having to explore everything in a level. Numerous checkpoints lessen the penalty if the player dies. In conjunction to this, many health items are littered throughout the stages to decrease the chances of dying during battles. As the game progresses, the difficulty curve of the game increases slowly and there are no notable difficulty spikes observed. Super Lucky’s Tale is a great family game to play which doesn’t take itself seriously. The bosses in the game are also generous, attacks are clearly choreographed and after every phase healing items are given to the player. This almost makes dying to a boss near impossible and again positively reinforces the gaming experience for lesser skilled players or for people who just want to play for fun. High Replayability: Levels contain 4 clovers each with each clover requiring Lucky to accomplish a certain feat during the stage. The 4 objectives for the clovers are as follows: Complete the level, find the Secret Clover in the level, collect 300 coins in the level and find all 5 hidden letters in the level to spell the name “LUCKY” These 4 objectives can be completed in any order and the player is free to skip any of the additional challenges they cannot complete barring the initial clover obtained for completing the level. The player is rewarded for exploring and interacting with the game environment, often resulting in finding hidden rooms where the player can access minigames to earn the secret clover, or find additional coins or gems to contribute to the 300 coins required for the money based clover. Also littered around the stage are 5 letters which spell out the word “LUCKY”, collecting all 5 letters rewards Lucky with a clover. The letters are in order so the first letter which will appear will be “L”, and then “U” and so on and so forth. This is a good indication if you have missed any of the letters and hints at possible missed secrets, which promotes exploration of the stage thoroughly. All letters and clovers which are collected are saved, so if you come back to the level later you can resume and finish it off completely. As stated, having 4 distinct objectives diversifies the way the game is meant to be played. Coins have an actual purpose as it results in obtaining a clover to help unlock additional levels and boss fights. Secrets lead to time trial minigames which also changes the gameplay. The overall experience of these challenges increases replayability because it transforms the game from a simple “go from point A to point B” formula which many platformers employ and expands upon the platforming genre. Various Minigames and Gameplay Style: Super Lucky’s Tale diversifies the style of gameplay the player will experience throughout the levels and minigames it provides. The standard levels in Super Lucky’s Tale consist of a 3-dimensional environment in which Lucky can free roam anywhere in the level to collect coins or complete other miscellaneous tasks. These 3-dimensional levels are also segmented with traditional 2-dimensional side scrolling levels. Super Lucky’s Tale adds an additional twist to these sidescrolling levels by sometimes allowing Lucky to traverse from the foreground and into the background to collect coins or hidden items which adds an additional layer of ingenuity. Alongside the traditional levels, Super Lucky’s Tale has numerous minigames and puzzles to challenge the player to complete. One type of these puzzles are the sliding block puzzles, in which Lucky must push blocks on a grid to cover certain spots on the map. Another type of challenge is a homage to the Super Monkey Ball franchise. Lucky is placed in a sphere and must collect all the coins in the level, the only difference is that touching the left analog stick tilts the level, causing Lucky to roll in that direction. The player must navigate through numerous hazards to get to the end of the stage. These are only a few examples of additional minigames littered throughout Super Lucky’s Tale, but there are many more activities strewn about the game. Bizarre Design Choices: Super Lucky’s Tale has many bizarre design choices which detract from the gaming experience. The first example is the inclusion of the spin attack. The spin attack is an entirely redundant move as it can very rarely kill any enemies. Most enemies hit by the spin attack are just stunned momentarily and then simply recover. The main method of killing enemies is via jumping on them. Due to this, spin attacking enemies is a waste of time and the player should always just jump on them to ensure the kill. The spin attack can collect coins, but apart from that the inclusion of the move is confounding considering the lack of utility and applications it provides. The second main problem is the double jump. 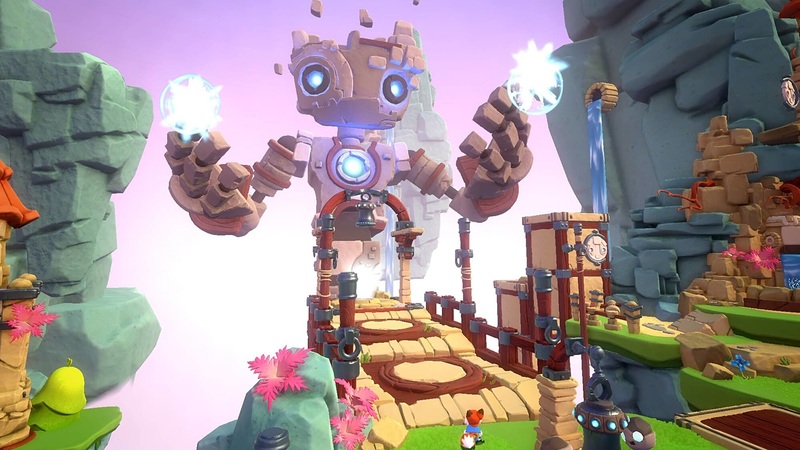 Many platformers incorporate a double jump mechanic to allow the player to navigate through obstacles present in levels, the main problem is that the double jump in Super Lucky’s Tale provides a negligible amount of vertical height that there’s almost no point in using it unless you’re trying get across a large horizontal distance. Like the spin attack, the double jump is also another skill which is sorely lacking. Digging is an ability Lucky has access to, this ability allows Lucky to burrow underground to collect coins or defeat enemies. The main problem is that very rarely in the game is digging used or incorporated into the level design, as a result it becomes the least used move in Lucky’s arsenal despite being a very interesting game mechanic. Later levels also include a lot of “hard surfaces” which prevent Lucky from digging into the ground, this further makes the digging skill obsolete in the later worlds. Coins Have No Use: The issue with coins is that apart from providing a clover when you collect 300 coins, they don’t contribute to anything else. This is very evident in the hub world, where the domain is littered with coins and gems. In the hub world there are no clovers for collecting coins, yet there are thousands of coins scattered around. Even if the player spent time collecting them all, there would be nothing to use them on, making them a useless resource unless you are in a stage and are specifically going for the 300-coin clover. This is definitely a missed opportunity in which the collected coins could have been used in a shop to buy costumes or other form of power ups. Unorthodox Camera: There are also a few minor problems which need to be mentioned, one being the camera for the 3-dimensional levels. Instead of having total control over the camera like in most platformers, you only have partial control. Touching the right analog stick will make the camera rotate by 45 degrees. Due to the stiff controls, half the time you can barely see where you are going and you can’t fully rotate the camera since the game restricts you from doing so. This camera issue is also exhibited in the 2-dimensional levels but in a different manner. One gimmick introduced is the ability to traverse from the foreground to the background, but in pretty much all circumstances when you travel to the background, the foreground scenery is still present and as a result you can’t see where you are or what obstacles are in the way due to the foreground scenery blocking the view. Technical Issues: Once you start Super Lucky’s Tale is becomes very apparent that the game is very unpolished as a product. During many levels there are constant frame rate drops which are very noticeable, especially on boss levels in which the bosses shoot out many projectiles at once. Moreover, Lucky has a very bad ledge grab detection and most of the time he will not grab onto a ledge, sometimes he will simply teleport up the ledge or fall through the ledge. Lucky can also clip through the floor and walk through objects at times. Lucky’s shadow also can phase through objects which shows the unpolished nature of the game. Overall there are many bugs and glitches which are present albeit none really break the game. 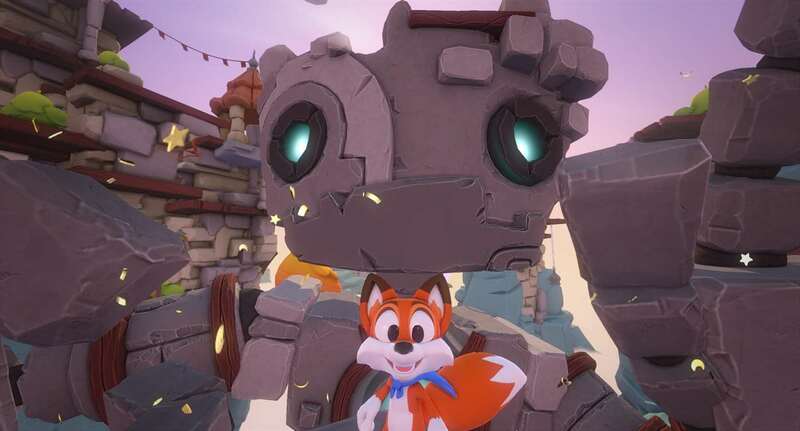 Lack of Story: Super Lucky’s Tale, like many platformers, suffers from a lack of story. Whilst initially the game starts off promising, the storytelling declines ones you take control of the main character. After you complete each world you get a short letter from your sister wishing you luck, but apart from that no real mention of the story ever occurs. All you have to do is complete the levels in the world and beat a member of the Kitty Litter group and once that’s complete you repeat the process 3 more times until you complete the game. The main problem is that the characters are all sucked into the “Book of Ages”, each world representing a chapter of the book and by completing each world you “progress” through the Book of Ages. Once you beat all members of the Kitty Litter group you reach the “end” of the Book of Ages and are released by the book. The problem is that there’s a disconnect between the player and the characters inhabiting the Book of Ages. The game introduces character after character from level to level only for them to be forgotten as you proceed to the next world. No characters have any personality or matter in the game barring the Kitty Litter group. Super Lucky’s Tale is an example of an average game, whilst it tries to do something fresh and new, it ultimately falls due to bad design choices, a lack of polish and the lack of story. Despite this, there is a lot of potential for the game and many of the technical problems could easily be fixed in the future, but as of now these downsides severely detract from the game and hinder the player’s gaming experience. 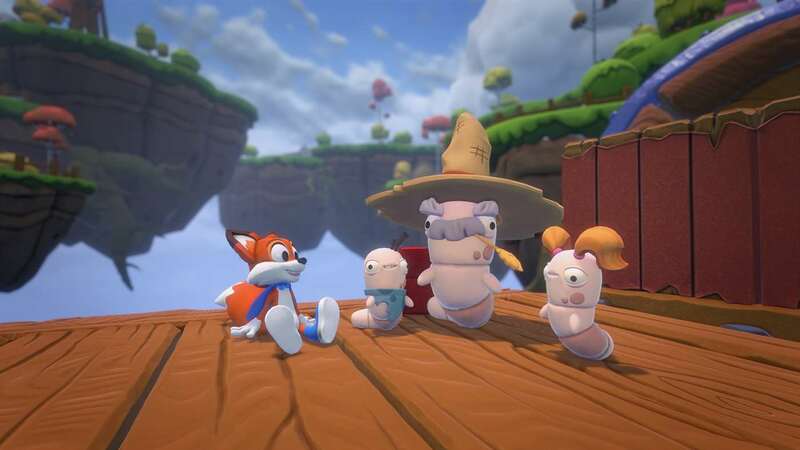 Super Lucky’s Tale was developed by Playful Corp and published by Microsoft. It was released for Xbox One [reviewed] and PC on November 7th, 2017. A press review copy was provided for The Hidden Levels. Many studios submit copies for site review but this is in no way factored into our review scores. Games are scored on their individual merits and our rating system is explained here.